UTLA President Alex Caputo-Pearl welcomed teachers to the new school year and urged them to get involved in a media campaign for late August, according to a recorded robo-call that went out last night. In the recorded message by Caputo-Pearl sent out Sunday night before teachers return to school, he complimented teachers for the “amazing people and work in our public schools” throughout the district. He also said union chapter meetings will be held starting the second week of school that will discuss the unprecedented media campaign and call for possible demonstrations later in the school year. The school district may be involved with a nationwide “walk-in” in October as they did last year. 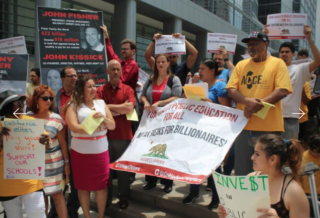 The UTLA president also repeated his call that “billionaires should not be driving the public school agenda,” talking about wealthy Californians who the union says undermine public schools. The robo-call is meant for the 31,000 teachers represented in district schools and some charter schools at LA Unified. Starting late August and running through the month of September, the UTLA public relations campaign will include billboards, posters and online messages that will feature union members, students and parents from the district.